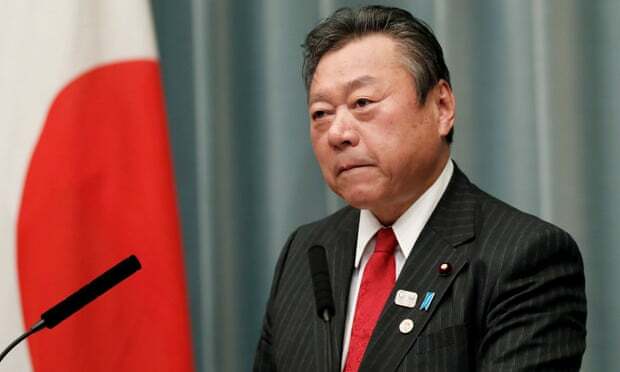 Japan’s Olympic minister resigned Wednesday after making remarks deemed offensive to the people affected by the 2011 earthquake and tsunami, a gaffe that prompted some to question his credentials. Yoshitaka Sakurada said he submitted his resignation to the prime minister, Shinzo Abe. He said he made comments that hurt the feelings those in the disaster-hit areas, and just retracting them would not be enough. Sakurada, at a party earlier Wednesday for Hinako Takahashi – a ruling lawmaker from Iwate, one of the prefectures severely hit by the disaster – said Takahashi is more important than reconstruction. Abe was quickly in damage control. Soon after accepting Sakurada’s resignation, he apologised for the minister’s remark to the people in the disaster-hit region, reassuring them that his government has an unshakable policy to do the utmost for reconstruction while staying close to the feelings of the people affected. “Minister Sakurada’s resignation is only natural. It was an unbelievable comment that hurt the feelings of the people in the region and others working hard for the reconstruction,” said Yukio Edano, leader of one of the a main opposition parties, the Constitutional Democratic Party of Japan. Edano also criticised Abe for repeatedly defending Sakurada despite his repeated problems since his appointment. Sakurada’s resignation is also an embarrassment for Abe, who saw another cabinet member step down over a questionable remark. Deputy minister of land, infrastructure, transport and tourism minister, Ichiro Tsukada, quit last week after suggesting he acted for the interests of Abe and the finance minister, Taro Aso, over a road project related to their constituencies, prompting opposition lawmakers to seek explanation though he denied any preferential treatment.